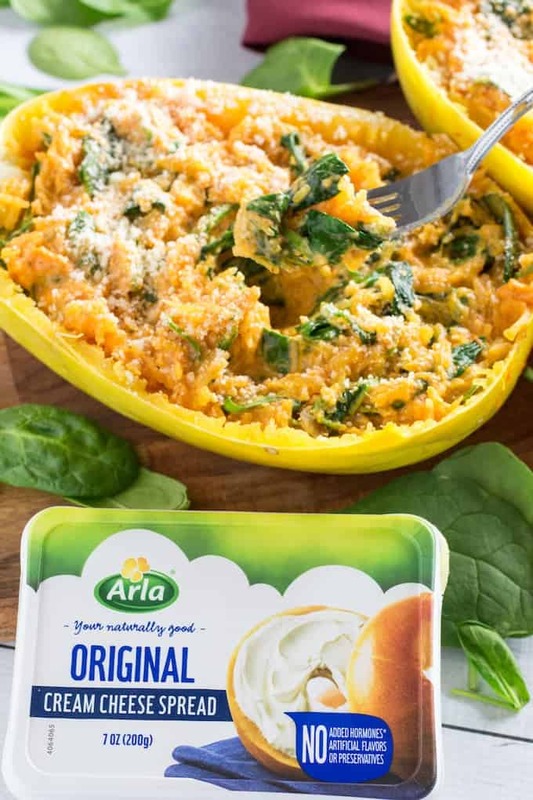 Sponsored Post: This post is sponsored by Arla but the content and opinions expressed here are my own. 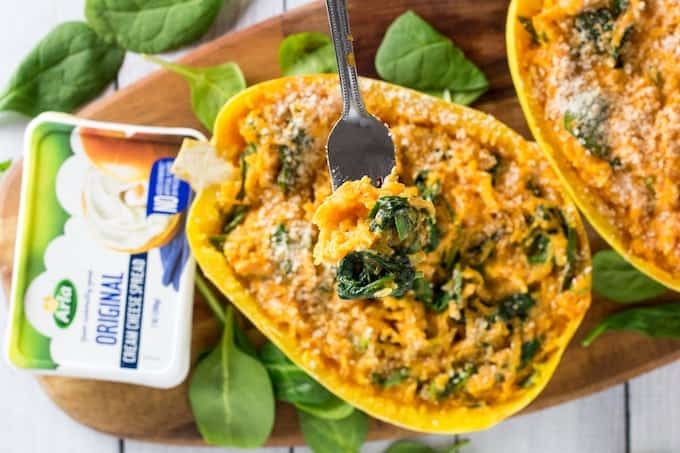 Roasted Red Pepper Spaghetti Squash Alfredo is a creamy blend of roasted red bell peppers, parmesan, cream cheese, baby spinach, and spices. The savory sauce is mixed with spaghetti squash and wholesome chicken breast for protein. I’ve been eating healthy for three weeks now, but I still find myself craving comfort food. So I’m on a mission to take some classic comfort foods and turn them into something I can enjoy, and continue my healthier lifestyle with. 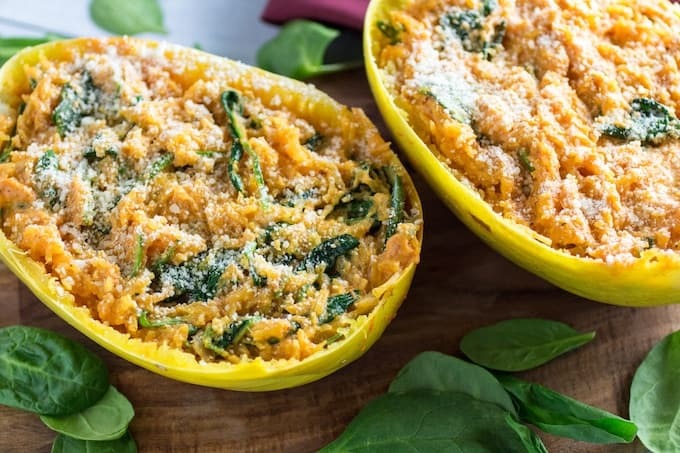 Roasted Red Pepper Spaghetti Squash Alfredo certainly fits the bill. 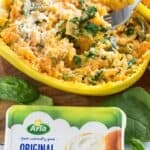 To make this even better, I’m participating in the Chopped At Home Challenge presented by Arla® and FoodNetwork.com! Honestly, there’s nothing better than a really, really good Alfredo sauce. But you’re not going to get it from a jar. Making Alfredo sauce from scratch is actually really easy to do! If you don’t believe me, check out my one pot chicken Alfredo recipe to see how easy Alfredo sauce from scratch can really be. And it’s especially easy when you have some really fresh ingredients on hand, just like the ones you get in the Chopped challenge basket! So as any good Chopped fan knows, contestants are presented with a mystery basket of ingredients and have to make a recipe featuring them. For my basket, I was given chicken breast, baby spinach, roasted red bell pepper, and Arla cream cheese. To me, these ingredients just scream Alfredo sauce from scratch! And speaking of fresh ingredients, Arla is a farm-to-fridge dairy, so the fresh milk comes directly from farms owned by Arla’s proud farmers. The Original cream cheese is made from only four simple, recognizable ingredients: cream, skim milk, cheese culture and salt. Which means it’s free from artificial flavors, preservatives, thickeners and stabilizers, so you can feel good about feeding it to the entire family. 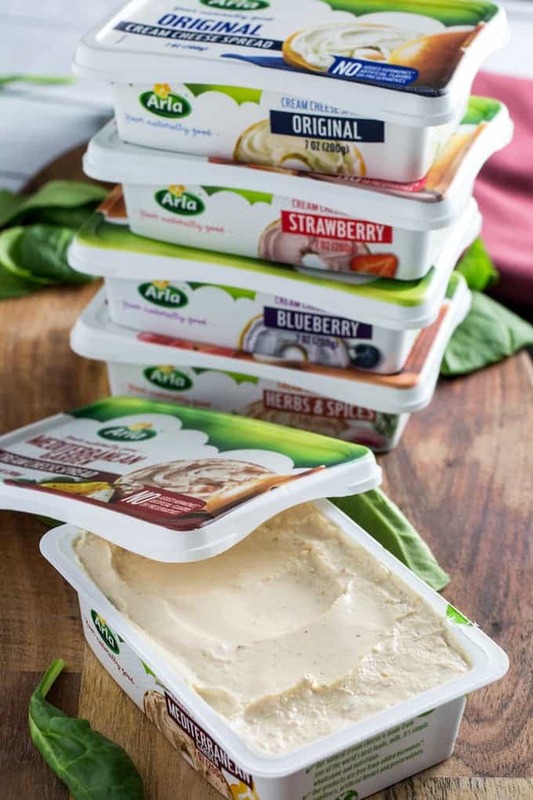 Arla cream cheese is available in multiple flavors, including: Original, Herbs & Spices, Blueberry, Mediterranean Garden, Strawberry and Skyr. One of my favorite things about this dish is that it’s really lightened up from traditional Alfredo sauces. I’ve made this homemade Alfredo sauce without cream, and instead used a combination of 2% milk and cream cheese. It has less calories and is packed with great flavor from roasted red bell peppers and spices. And you still get the cheesy flavor of the parmesan that you love. You may never go back to the old way, and instead embrace the homemade Alfredo sauce without cream all the time! Thickening Alfredo sauce is not as hard as you’d think. For this one, the combination of pureed veggies and cream cheese are really all you need. But if you want to know how to thicken Alfredo sauce in general, there’s a few things you can do. My favorite way is to start with a good roux. You melt a few tablespoons of butter in a saucepan, then whisk in gluten free flour. Whisk it together for a minute or two, then add a cup or two of milk. Continue to whisk until you see the sauce thicken up, then add your cheeses and seasoning and stir until it’s thick and melted. Side note, this is also how you make a great mac and cheese! If you’re already in the works and need to know how to thicken Alfredo sauce halfway through, I would suggest two things. Either whisk in a bit of arrowroot if you have it (or gluten free flour), or throw in a few handfuls of cheese. That’s it! It’s pretty easy, and soon you’ll know how to thicken Alfredo sauce like a pro! Preheat oven to 375F. 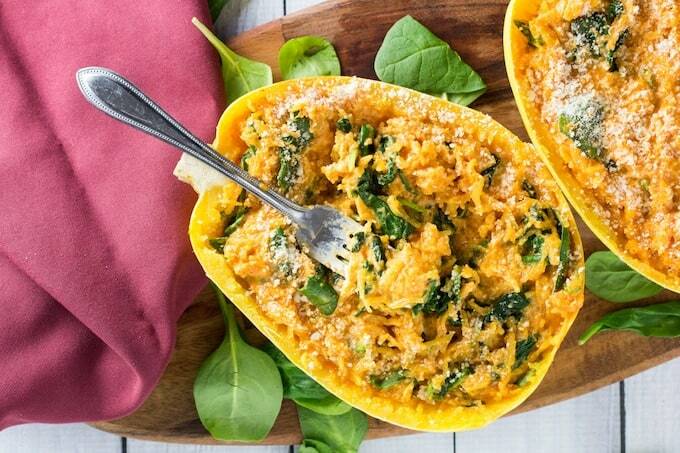 Cut spaghetti squash in half and scoop out seeds. Add 1-2 cups of water to cover bottom of a sheet pan and place squash open-side-down on the pan. Bake 10-15 minutes, or until a fork goes through easily. Remove from oven and cool, then scoop out insides into a medium mixing bowl. Set aside. In a medium saucepan add olive oil and chicken. Stir occasionally, until chicken is cooked through. Remove from pan and set aside. In the saucepan melt butter and sauté onion until translucent (about 5 minutes). Add cream cheese, spices, and milk. Stir until cream cheese is mixed in and melted. Add red bell peppers and parmesan. Cook on low-medium heat for about 5 minutes, stirring frequently. Use an immersion blender to blend all ingredients together. Add baby spinach, stirring frequently until spinach is cooked and mixed in. Add Alfredo sauce and chicken to spaghetti squash and stir everything together. 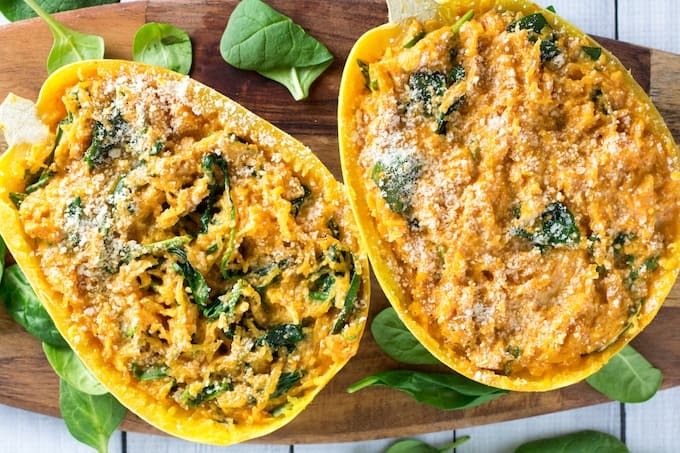 Pour mixture back into the spaghetti squash halves. Top with additional parmesan and serve.